The Spa at The Midland offers a stylish retreat from the busy pace of Manchester city living – and won Residential Spa of the Year 2017. With its new Evening Calm in the City package, you can take a break with the ultimate slice of pampering to recharge your spirit and realign your body. This evening on the town feels more like a night in, providing you with ample opportunity to indulge and restore. As part of the package, you get access to the spa’s Alder-wood sauna with a Himalayan rock salt wall, salt-infused aromatherapy steam room and the beautiful swan neck fountain in the relaxation pool. You can also book in an optional express treatment, which is perfect for working on problem areas. The evening is then rounded out with a delicious two-course evening meal in the 2 AA Rosette awarded restaurant Mr Cooper’s House & Garden – gluten-free, dairy-free and other dietary requirements all catered for. The spa itself is gorgeous. Tucked away in the refurbished basement of Q Hotels’ The Midland, it cleverly retains period features such as the high ceilings and original tiles, with its own private entrance next to Mr Cooper’s. Guests are provided with towels, robes and slippers, so you can come, as we did, straight from the office. 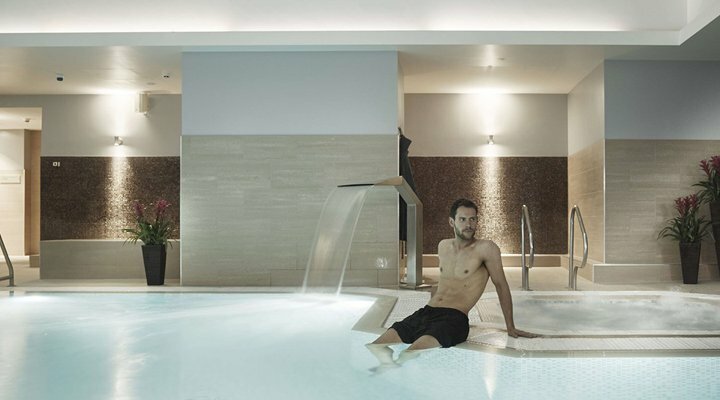 There are eight well-equipped treatment rooms, a spa café with a range of healthy dishes (and a more luxurious afternoon tea if you’re celebrating), a tranquil pool and jacuzzi, a sauna, a rasul for two, a steam room, a tropical shower to revitalise, a private duplex gym and a tranquil relaxation zone. The use of Himalayan rock salt in various locations was wonderful for me, since I have asthma and Himalayan salt is one of my go-to treatments (I have pink salt lamps at home and a Himalayan salt pipe). It also made my skin feel great. Meanwhile, the tropical shower, with its hot and cold settings, gives your metabolism and circulation a much-needed boost. Treatments include a host of anti-ageing facials using the celebrity-favourite 3D Skintech machine, as well as a number of face and body treatments using Espa products. Our express treatments were 30-minute focused massages – we opted for neck and shoulder massages, as these are key problem areas for anyone who works at a desk all day. I’ve complained of knots in my shoulders for years, and most massages have soothed them without getting rid of them altogether. I’ve been told multiple times that, ideally, I should be returning every fortnight to work on them. I told my therapist and she did a really great job – though our time was limited, she worked the knots down. I’ve since managed to get rid of them thanks to her hard work in just 30 minutes. The split-level gym only ever has 200 members, so you can be sure you’re in good company and won’t be fighting for machines. Though we didn’t visit The Gym this time, you can read all about it from Alex Vergette and enter our competition to #win a free membership for you and a friend. The Midland has an award-winning food offering, with two restaurants to dine in. Spa guests can also enjoy their healthy platters or decadent afternoon tea in the spa’s dining area downstairs. However, with the Evening Calm in the City package, you get to go one step further and dine in the horticulturally-inspired surroundings of Mr Cooper’s House and Garden, complete with its range of menus that cater to a range of dietary needs so you don’t need to spoil your health drive when you reach the table. Gluten-free? No problem. Dairy-free? Easy peasy. Which is great, since I’m both lactose-intolerant and gluten-free (technically I’m on a paleo/ketogenic diet), and my co-director Michael Bryant is vegetarian. Neither of us had any problems and we had plenty of choice. Stay tuned for a full review of Mr Cooper’s later this week. Spa available bewteen 5pm-8.30pm and Mr Cooper’s 5pm-10pm. Prices start at £49pp. Additional Express Spa Treatments are available from £20pp.